This year, Father’s Day will be held on June 19th . President Richard Nixon declared it a national holiday in 1972. It’s a fact: as Christmas, Easter and Mother’s Day celebrations, Father’s Day generate high consumption peaks. 76% of Americans celebrated Father’s Day last year. In average, Americans spent 115 USD which amounts for 12.7 billion USD overall. At Adintime, we bring you the key characteristics of the US Father’s Day market for your communication plans during this lovely celebration. Since 2004, Father’s Day spendings have been consistently increasing in the U.S.. 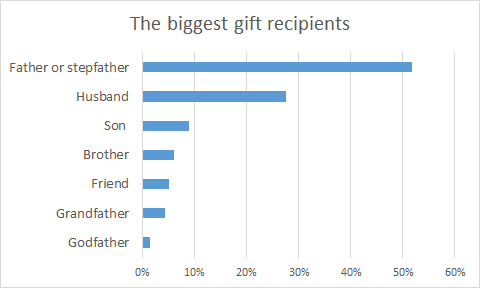 Naturally, Dads are the biggest gift recipients on Father’s Day (51,8% in 2015). However, Americans not only buy presents for their father but for their other relatives too (28% of husbands received a gift last year and 9% of sons). 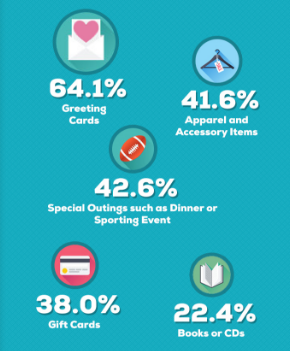 Last year, 64,1% of Americans planned on buying a greeting card for their father. Special Outings (42.6%) and Apparel and Apparel and Accessory Items (41.6%) were among the other presents on the shopping list. In 2015, Department stores were the most favored choice by Americans to purchase their present for Father’s Day. Advertising rates for Father’s Day are noticeably more expensive a week before the celebration. Even though it is important to communicate during this last week, your campaign will be more effective if it starts before this week in which everyone else is advertising. As we explained in past articles, communicating on various supports is proven to result in a better ROI. 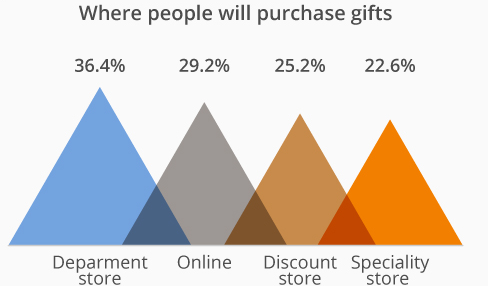 Beyond the 30% of Americans who purchase their presents online, many browse the web looking for present ideas on Father Day’s. -Blog Articles: these articles will enable you to gain additional visibility and to get in touch wit your audience. Focus on your brand identity and the benefits derived from the use of your prduct/ service. Don’t forget to add links on your pages. - Social media : A must-use tool in your conversion funnel, particularly in B2C. It enables you to reach a large audience and to establish your credibility. Its weakness is that you need to repeat your ad to get results, making it an expensive investment. Local or national, consumer or specialist… print medias reaches directly a specific audience. Surveys about the readership enable you to precisely know the profile of the audience. Print is generally used to target a specific audience. For example, communicating in women’s magazine enables you to reach wives and female teenagers, likely to purchase a present for Father’s Day. Affordable for average budgets, it is also used to target specific audiences. Radios can be divided by sectors: young people, musical, economy…. The weakness lies in the attention of the audience. Impactful and efficient to increase the awarness of your brand.From national to local geo-targeting, billboards, weather they are print or digital will deliver your message to a great number of people. Locations are of course deeply strategic on this media. At Adintime, we can help you choosing the right media at the best negotiated budget to serve your campaign objectives. An internet communication generally isn’t enough to ensure a successful communication campaign. Communicating on various means will generate a better ROI than a campaign on a single media. We hope this article help you to establish your communication campaign for Father’s Day. Happy Father’s Day in advance to all fathers !